In reality when I filled it the base was more like 55x35x25 - something to be mindful of when filling it for use on ryanair as they will charge you! 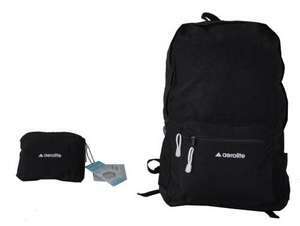 Ordered, thanks, my old 35L rucksack is battered and was looking for a replacement. Think the 55cm measurement is 5cm over EasyJet's guaranteed carry-on cabin luggage size, but great delivered price. if you have a home bargains nearby, they do a similar item, its a tenner too, but no waiting around. very useful and has survived a few trips already. Ordered as a xmas gift, thanks. unfortunately no home bargains near me anf not travelling until xmas time. I use ryanair a lot. As long as I don't overfill it and leave some space it will be fine. I just use an Eastpak / Jansport rucksack as a carry on. Does all of this and so long as you are mindful when filling, you'll be happily in the allowance, plus they last forever. I just use an Eastpak / Jansport rucksack as a carry on. Does all of … I just use an Eastpak / Jansport rucksack as a carry on. Does all of this and so long as you are mindful when filling, you'll be happily in the allowance, plus they last forever. Thanks, found this deal just when I needed...bought one now, Cheers! !